Call for artifacts for the People's Museum! 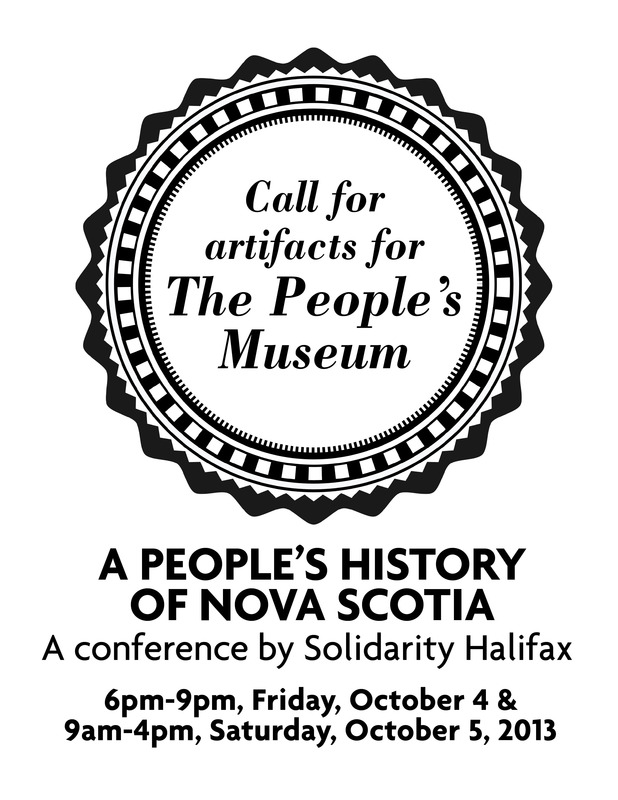 A People’s History of Nova Scotia will feature a People’s Museum that will tell a visual narrative of radical struggle in Nova Scotia. The tools of resistance, be they posters, banners, t-shirts or song sheets, help demonstrate the creativity, resourcefulness and perseverance invested in the work of creating lasting, positive change. The Museum will be on display throughout the conference and will be mounted on the walls, displayed on tables and hung in the conference space. or any other souvenirs you may have to contribute to the narrative of the left in NS. Where possible, please also include a brief write up about where this object came from and what the context was that surrounded its creation. We hope to highlight the struggles of the left through the inclusion of these items in the conference. The owners of the objects are responsible for the pick-up of their items from the ‘museum’ organizer. Pick-up can be arranged at time of drop off.